My local public broadcasting station, WAMC/Northeast Public Radio, just raised $1,034,896 in a one-day fund drive, and they’re hoping to start a trend. The time may be ripe for other public broadcasting stations and their viewers and listeners to follow WAMC’s lead and man the barricades as well. Calling federal support for non-commercial public media and the endowments “corporate welfare” and a waste of taxpayer dollars, Republican deficit hawks, who have placed privatizing the Corporation for Public Broadcasting (CPB) and defunding the National Endowment for the Arts (NEA) and the National Endowment for the Humanities (NEH) at the top of their wish list for years, are gearing up to do battle once again. With Donald Trump’s election and an emboldened Republican majority in the House and Senate hell bent on shrinking the federal bureaucracy with scant concern for real-life consequences, the welcome banner for defunding is flying high. In a troubling sign, the latest budget proposal of The Heritage Foundation— the highly influential Republican think tank with an inside track to House Speaker Ryan and the Republican majority—calls for draconian cuts to the federal budget that would include taking an ax to CPB, NEA, and NEH. Just how significant would be the effects of privatizing CPB and defunding the NEA and NEH on shrinking the federal budget and reducing the national debt? The answer is simple: try not to blink because you might miss catching a flicker of the micro savings. 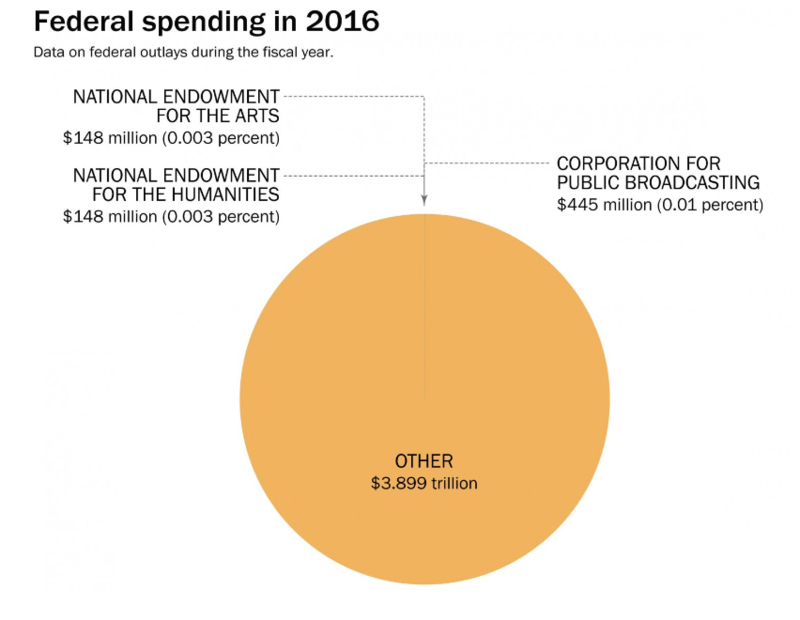 After all, the combined federal funding for CPB, NEA, and NEH represents just .02% of the overall federal budget. To understand just how little treasure is on the line, take the annual appropriation for the Corporation for Public Broadcasting, which in 2016 was $445 million. That number represents an annual cost per person in the U.S. of a paltry $1.35. For all the thought-provoking reporting, educational content, and sheer pleasure we get for our $1.35, I’d say that’s hands down the best deal ever to wend its way out of the beltway. Of course, putting the three organizations on the chopping block accomplishes far more toward advancing the Republican agenda than just a symbolic show of a few dollars saved. Crippling organizations that play an essential role in supporting and advancing informed and diverse dialogue in politics and the arts furthers the goals of conservatives hell bent on turning back the social, political, and cultural clock and shrinking access to a fact-based world. Take your pick from a menu of negative impacts and chilling effects if public media and support for the arts and the humanities were to disappear: Less access to children’s educational programming. Less access to unbiased discussion and informed debate about local, national, and international issues and public affairs. Less access to learn about transformative breakthroughs in science. Less access to diversity in cultural, educational, and scientifically focused programming and less access and support for interdisciplinary scholarship and innovations in the arts, media, and the humanities. Of all the cast of questionable characters in Trump world, Republican Congressman Paul Ryan stands out as the perennial cheerleader for gutting essential federal funding for public media and the arts. In 2007 Ryan backed an amendment to defund the Corporation for Public Broadcasting. In 2011 he voted in favor of a bill to eliminate support for National Public Radio. In 2014, as chairman of the House Budget Committee, Ryan drafted a budget that included elimination of federal funding for the Corporation for Public Broadcasting and the National Endowment for the Humanities. With his animosity to federal funding for media and the arts, Ryan has positioned himself as heir apparent to Newt Gingrich, Ronald Reagan, Richard Nixon, and George W. Bush—all of whom tried, but failed, to defund or diminish non-commercial public media and the national endowments. Taking for granted that history will repeat itself and defunding will slip through Republican fingers yet again certainly does not seem to be a sentiment shared by Dr. Chartock nor the listeners and supporters of WAMC. In the few weeks prior to the station’s February surprise, WAMC started promoting pre-fund-drive donations to what the station calls the “lock box.” By the time the official fund drive kicked off, the lock box contained $570,000 in pledged donations. In an apparent nod to the unprecedented attacks on the media by the White House, for the first time in WAMC’s history the staff decided to promote on-air its First Amendment Fund, an innovation dedicated to setting aside rainy-day funds for first-amendment challenges. According to Chartock and WAMC CFO Holly Urban, the day of the fund drive listeners stunned the radio station’s administrators and commentators by pledging $50,000 in the first hour. In previous fund drives, the average pledged donations in the first hour tallied to approximately $6,000. To everyone’s astonishment, in the second hour approximately $100,000 came in. Then, in the remaining twelve hours, enough donations were pledged to meet and exceed the station’s entire ask of $1 million. I’d say that’s really smart advice in this perilous time—not just for public broadcasting and the endowments but for all of us.